Welcome to the Seventeenth Edition of the Owen Guns Bulletin. Parker-Hale Super Deluxe Commercial Mauser so more than likely will have a standard chamber. Thus in a normal sporting bolt action rifle 25 pounds pressure on the bolt handle will result in about 125 pounds push or pull on the case. But the construction of the usual lever and pump action mechanisms is such that pressure on the lever or, slide handle results in never more than about twice that amount on the case. Therefore chambers for such rifles must be cut with considerably more clearance over the cartridge than with bolt action rifles just discussed. Generally speaking the clearances should be increased about one third. So we can expect some decrease in accuracy due generally to the design and this applies to these fancy expensive straight pull rifles from Europe there potential is severely limited. If a lever or pump action rifle were provided with a chamber cut with the small diameter clearances specified for bolt action rifles there would be so many failures, not only to extract, but to insert slightly large, dirty, or corroded cartridges that easy operation would be impossible much of the time, and no one would want such a rifle. 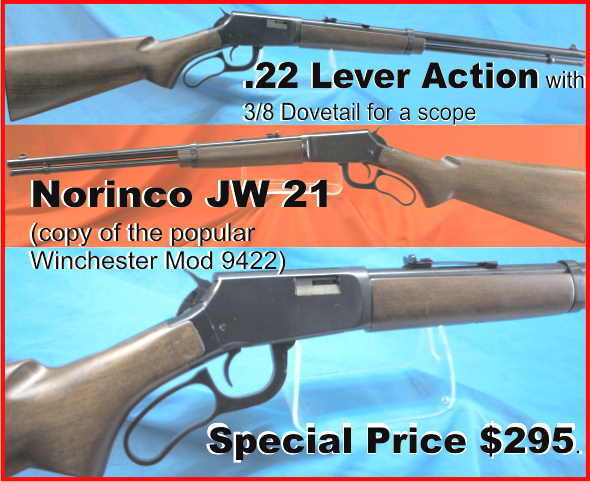 Moreover factory cartridges for use in lever and pump action rifles are loaded to a chamber pressure measured in the large chamber in which they are used, and such cartridges would sometimes give excessively high pressures in a tighter chamber. Incidentally, one of the reasons why lever and pump action rifles cannot be made to give quite the fine accuracy of bolt actions is because of their larger chambers. Chambers with large clearances are not conducive to the best accuracy the cartridge does not lie concentric to the bore at all times, this creates inconsistencies. As the Straight Pull action has not got the cam extraction the chamber specifications will be larger. Even the bolt action chamber as previously described is large in diameter for all but the absolute maximum cartridge, and such a cartridge is very seldom seen. The question therefore arises, why not cut our chamber to a close diameter fit on the usual or normal cartridge and thus obtain better accuracy? 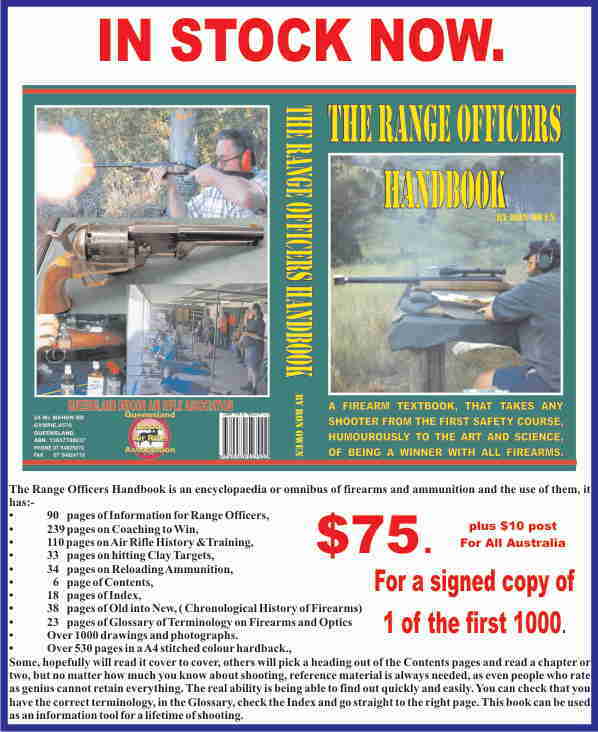 It can be done to a slight extent if the owner of the rifle will be extremely careful with the selection of his cartridges and the components thereof, and under stands throughly the limitations of such a chamber. But a very tight chamber would be unsatisfactory for the ordinary user, who would expect his rifle to function perfectly and be safe with any factory cartridge of any make and of the proper calibre. 1. They would not accept factory ammunition, or even factory cases unless the latter were reamed at the neck. 2. The bullets had to be of the exact diameter for which the chamber was designed, and it was extremely difficult to surely get factory bullets of this exact diameter. If bullets were as much as .00025 inch oversize, dangerous pressures, as well as insertion difficulties, arose. 3. Extraction difficulties became prohibitive in a hot barrel or with slightly corroded, or cases with a rough surface finish, or dirty cases. Colt Lightning Pump action would have a larger chamber. So no one except the very rich experimenter uses such tight chambers today, and best practice is to adhere very closely to the chamber diameters already described. 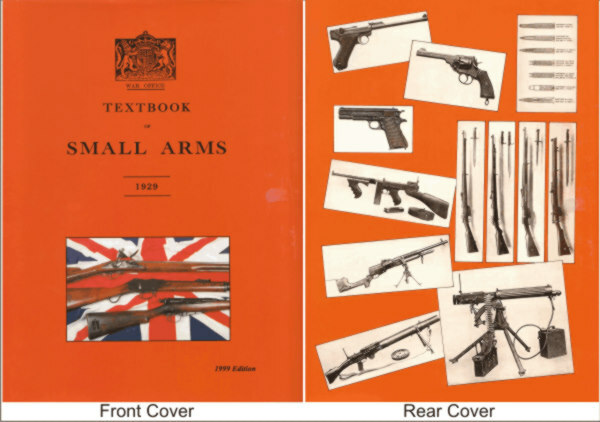 Until the future proves us wrong most think at the present time that the standard bolt action chamber clearances are about the ideal, and cannot be improved on from the standpoint of accurate shooting they have been standardised now for at least 30 years. At least we have innumerable instances where production barrels manufactured by good quality manufacturers chambers have given “half a minute of angle” groups regularly. But, as stated before, it takes the best ammunition, as that can be customised to the individual chamber, as well as a good barrel, to give good accuracy. Next edition Chamber lengths and head space. The Belding & Mull powder measure was always the one that the best were measured against but these days we all use a variation of the Belding and Mull designs. 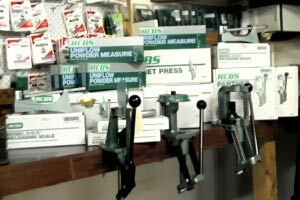 The RCBS Powder measure is as good as any on the market to day. There are numerous ways of using the scale balance to simplify the work for the reloader. One of these is the use of a powder measure set to throw a charge slightly under that required. For instance, if I want a 48 grain charge to load 30-06 cases I set the powder measure to throw about 47.5 grains. This charge is emptied, via a funnel and plastic ½ plastic tube, directly into the scales pan. Organise the tube so that it is very close to the pan so the powder granules do not bounce or ricochet out of the pan on to your loading bench. If this problem still persists it can be overcome very simply with a small piece of ordinary bond letter-paper was rounded to form a tube section approximately one inch high and two inches in diameter, stick it together with a piece of Sellotape. With the balance weight off the scale knives, (use your finger tip to hold down the beam so it does not bounce the beam) this tube was dropped into the pan and the charge from the powder measure emptied directly into the paper tube. The tube was then lifted aside to await the next charge the power hardly disturbed is still in the pan. Then while the scale beam is settling I use a Powder Trickler to drop a few extra granules of powder into the pan allowing it to settle and bringing it up to the exact weight of 48 grains. Then using a funnel empty the pan into the cartridge case. The Powder Trickler capable of adding a kernel at a time. Some use a small teaspoon instead of the tricker, some use a set of tweezers to take out excess powder from the pan if they have gone over with the teaspoon or the trickler. I have found the Powder Trickler much more precise so that the tweezers are hardly used. Some do not use a Powder Measure at all and just make a scoop from an old sawn of cartridge case sized so its just under the final weight and use it to drop the powder in the scale pan. Many others just set the powder measure with the scales and then directly fill the cases checking every five that the measure has not gone astray, this is quite acceptable for most shooters but this method does not take much longer and you have the peace of mind and the confidence that your ammo is the best that can be made anywhere. Oddly enough, there is no set rule for any of this and this is the most important part of the whole process. I have for different reason used all of the these methods, and owned and used progressive automatic reloaders where the system is totally dependent on the Powder Measures ability to constantly maintain consistency in the powder charge it drops into the case. Then other methods of checking the finished product have to be utilised. The reloader should experiment, and once he determines a system which appeals to him, he should use it to the elimination of all others, thus developing his own skill. Methods. In visiting various reloading laboratories, including the private labs of a great many reloading friends, (I mean laboratories as I have seen back shed reloading hobbyists with better facilities than the laboratories of major ammunition factories and better record keeping as well) I have watched with interest the methods employed, and while some systems proved extremely speedy for that particular operator, they were worse than useless for others. Some shooters, for instance, use a small spoon less than a quarter of an inch in diameter on the bowl. Such a spoon can be readily made out of a piece of sheet aluminum, its bowl formed by a brief hammering with an engineers round headed hammer with the aluminum held over end-grain softwood. In operation a small dish of the powder being used is kept on the front of the balance where it can be reached without undue effort on the part of the operator. He dips his spoon in and puts the necessary grains into the pan. I have seen some of the reloader who handle this spoon system so as to drop a single granule of AR 2201 into the pan or take one out with it. Steady hands, wow and they do it so quickly. I cannot do that, I have the steady hands and once had the eyesight for it but I have not got the confidence to acquire the knack, im to much of a fiddler. Some reloaders use a charge cup similar in form to the old style charge cups or what is commonly called a scoop, and years ago was available from the Ideal Manufacturing Company. 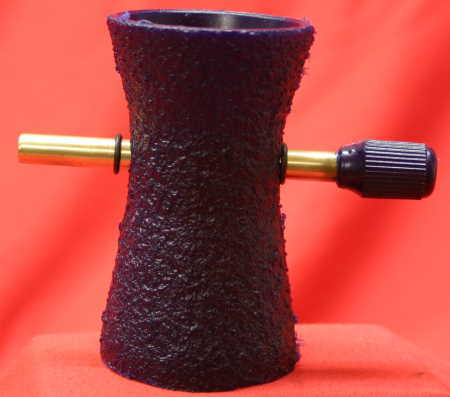 This was essentially a round cup formed of brass with a short handle soldered to one side. The Lee Reloading Company still manufacture the plastic sets. The bulk of the charge is poured from this cup directly into the balance pan and the necessary amount added to bring it to balance. The same pan checking system is used with excellent results in the hands of a skilled shooter reloader. Of course there are many who just use the charge cups, or what is commonly called a scoop, that at best a friend has weighed the powder and filed the top level with the required weight for one type of powder. They scoop this into a bowl of powder and draw a piece of cardboard across the top of it (like an old playing card) to make it level and the same each time. I have observed first class benchrest shooter loading this way and getting some fantastic results. They then just funnel it into the case and then seat the bullet. Some of those shooters shoot a five shot group and reload that same case five times to archive that group. Which is oaky if you have plenty of time. I use my own system Powder Trickler system as described above ,which I copied or learned from a good friend thirty years ago, John Andrews. (I’m sure he is using the same principles of set up today) I have used it to weigh out of many thousands of charges of different weights and types of powders. It is very common for the reloader to get too much powder into his pan, thus necessitating the removal of a portion of it. When this happens, it is vitally important that most careful attention be paid, and that no effort be made to remove any powder without taking the load off the bearings and knives! In a “lift” or “fall-away” type of balance, this is very simple, as a partial twist of the thumb nut does the job. This load must also be taken off the bearings before the pan is removed to discharge the powder into the awaiting cartridge cases. If you do not have one of these gadgets on your scales just hold one end of the beam down with a finger tip so that you don’t bounce the delicate mechanism into disrepair. I have several friends, however, who have an uncanny skill in removing this surplus powder with a scoop or spoon system. I have watched with keen admiration the speed with which they pick up one or two kernels of smokeless powder. Usually a man whom his wife would doubt that he had the dexterity to thread a needle is quite capable of delicately pouring from a spoon or scoop can and at the same time handle it with sufficient smoothness to remove a few grains of powder. One or two kernels of powder can be removed from the pan by having a small wisp of letter paper with a tiny dollop of Vasaline grease on the end of it half the size of a match head touch the powder lightly as one of two kernels will stick to the grease. Whalla!, the scales come down to the zero line. But if you use this technique do not put those kernels back in the tin or pan for reuse as the grease contaminates that powder or any powder it touches. An extremely useful accessory to the reloader is a magnifying glass mounted over the index to enlarge the view of the index scale and the swinging needle. This relieves the eye strain to quite a degree when using the balance for an extended time. 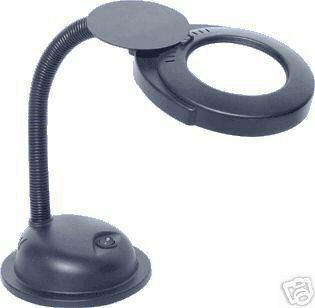 These magnifiers, as made consists of a 12 inch lens with a very narrow rim mounted on an excellent aluminum pedestal and adjustable by means of a swinging arm for both height and angle. Many are illuminated with round fluorescent tubes 5 magnifications an 18 inch flexible gooseneck that can be set in virtually any positions. (Warning, Keep them our of direct sunlight as they can start fires on your reloading bench, the better ones come with a cover and it keeps the dirt and dust off) They can be bought on the internet for $40. 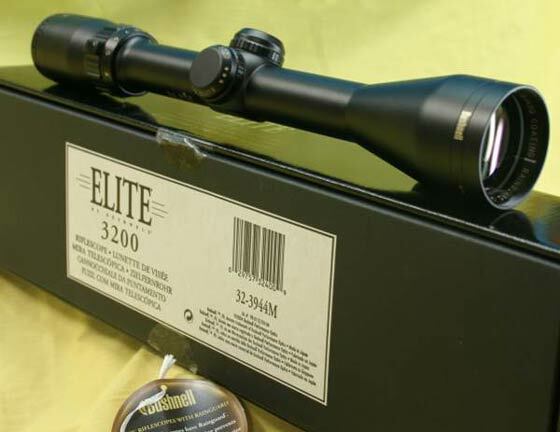 They are great for looking at the scale index, even with magnifiers distortion the distance will be equal on both sides and will serve to show at a glance how near to actual balance the charge is at any given moment. After all, it is only the centre of the glass, or zero point, which is actually used, they save a lot of time and eyestrain. They are also great for inspecting your used cartridge cases or as they have a good light they can be used for checking the consistency of powder levels in cartridge cases held in wooden loading blocks, as described later on in this book, prior to bullet seating. Reloaders often use powder scales balances to check all their cast bullets after lubrication. (And batches of jacket projectiles that there is any uncertainty about) Lead bullet casters will often find variations of as much as two grains, so before starting the job its best to place a series of empty boxes near the scales, for example for 158 grain .357, marked “157,” “157.5,” “158,”, “158.5,” and “159.” Bullets weighing more or less are relegated back to the scrap metal pot, others inserted in their proper box. Thus when the reloader uses his .38 Special for accuracy, he eliminates the possibility of “stringing his shots” due to variation of bullet weight. Speed? I have watched others grade more than 300 bullets in an hour as I have mentioned I get distracted and fidget, my mind wanders and I think of Quantum physics. Speed at these sort of skills is not my best subject, but I get there in the end and enjoy the process. Weights and Accessories. No balance, regardless of its sensitivity, can possibly throw charges more “accurate” than that of the weights used by the operator of the scales to check. Yet very little attention is paid to ‘Check weights’. A good set of check weights are as delicate as a good balance. In fact, it is more delicate and must be handled with the greatest of care. The weights should not be handled with the fingers, as the slightest moisture on them can create a form of corrosion not visible to the naked eye which will totally ruin accuracy by reducing the weight.A good way to take care of your weights is to store them in a dust free box where temperatures are reasonably constant and free from excessive humidity or moisture. Some handloaders use their weights at rare intervals, preferring to make up special weights of brass, aluminum, or some similar material for the actual process of weighing in the old double pan balance. 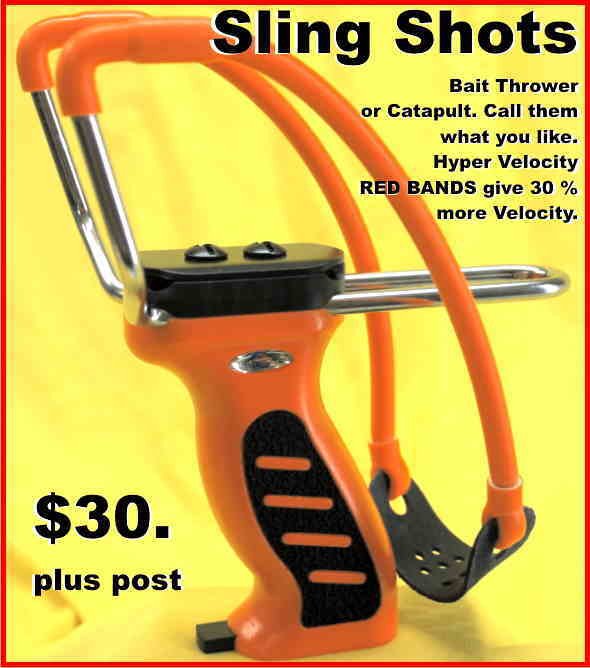 These are often built up at home in the exact amount of the most common charges used by the handloader in other words, to fit his pet rifle or handgun load. The idea is entirely practical, but it is well to check your homemade weights at regular intervals against your “laboratory” set of master weights to be positive that oxidation or scratching has not altered them appreciably. Homemade weights are rarely treated with the same reverence by their owner as his set of “tailor-made” ones, although unquestionably they have a very definite place in the handloading game. Delicate weights, like a deluxe gun, can be freely used without damage–if used right! Weights up to ten grains are usually made of aluminum in the lower-priced sets and in various nickel or chromium alloys, such as “palladium gold” or whatever the private trade name used by the manufacturers may be. In the more expensive sets they are made of platinum. The larger weights are made of either brass, bronze, or solid nickel, and are protected from oxidation or tarnishing by gold plating, chromium plating, or a coat of clear lacquer. The most accurate weights ever turned out can be quickly ruined through exposure to assorted atmospheric conditions. They should be kept in some form of box or cabinet, protected from contact with each other and free from dust and dirt. The experienced operator never handles his weights with bare hands. 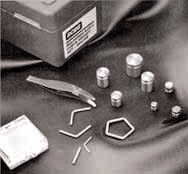 Small fractional weights are manufactured either flat or slightly “dished.” The flat types invariably have one edge bent at right angles so that they may be readily grasped with tweezers. The rim on the dished types also serves this same purpose. Next Edition , Powder Measures and their use. Email : OwenGuns@spiderweb.com.au and the External Ballistics Calculator program will be sent to you in .pdf format free of charge. Most of us have been fortunate enough to have experienced decades of relative peace, yes we have all had our troubles but we have had no ‘Enemy at the gate” wanting to bomb our civilisation into oblivion or put us all to the sword. Some would kill us ‘All’, if they had the opportunity but thankfully, the Western World has had a certain technological advantages that offset their fanatical determination. Besides those many technological advantages two other assets, twin features of our culture have kept us safe through the years, a large financial boiler room, which includes massive manufacturing capacity which produces that financial boiler room and the philosophy, the willpower to accept human losses, sacrifice of sons and brothers in organised disciplined units, dedicated to protect our Western Culture. These three assets are daily crumbling into the dust of time. A good American man (from Seattle) a friend whom I regularly communicate with, astute with his political observations and he sent an email in the week. The classic French Revolution of 1789 was sparked by “massive public debt”. ( I have a History minor at the University) Bush and now Obama have racked up massive public debt. What is going to happen, this can’t go on??? Bob I answered. 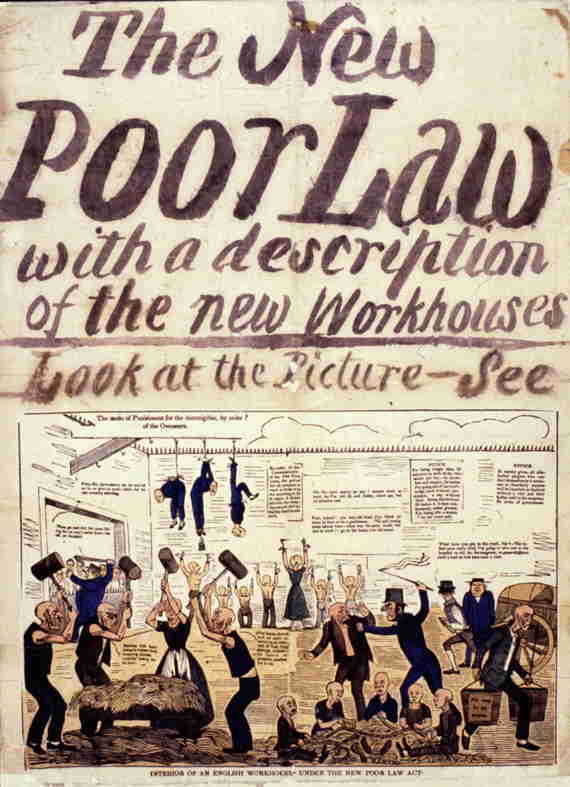 This poster from 19th Century shows Debtors working in the Poor House will they return? You are bang on the button, fancy the US tax payer giving Billion to General Motors to take their manufacturing capability and jobs off shore so that they can compete on the US market. That money goes to fund your enemy and build there industrial might. Very short, a temporary reprieve. The end of the Western Empire. The Roman Empire prior to the invasion of savages. Seems to be the nearest scenario. I did go through the formality of getting a University Degree and as I look back I can see that much of it was a waste of time but there were a few gems of wisdom I did acquire and which I use and am grateful that I went through the process. One Prof in and informal moment said ” there are two things which govern men and society MONEY and POWER.” I have discovered that there is in fact a third thing ” Service and an honest and unselfish interest to improve the lives of there fellow beings” but this is so seldom seen among the leaders of men that it does not register on the radar screen. I have had an interest in politics from my early college day and have tried to understand how so may things could go so unfavourably for us the tax payer, for years the only way I could explain it to myself was that things really are run by a conspiracy. The question was just who was in the conspiracy and did they ever hold meetings to plan strategy and if so where???? I have learned that it is not anything near as formal as that. If you get a large collection of people who’s first order of business is to gather wealth or power for themselves, throw a crumb to the tax payer and whalllla! you have a defacto conspiracy!!!!! Every person has a tipping point in regards to money or power!!! Where am I going with this idea?? In Australian we have had the Government dismantling our manufacturing capabilities, since the Lima Agreement in 1974 and the Stone Report which stoned Australians Car manufactures paying them money to go elsewhere with jobs, so we are oblivious to this philosophy. Free Trade killed our industry years ago, now its taking apart the USA. Bob has hit on many issue. The money and power is leaving the USA, the taxpayers are paying for the destruction of there manufacturing capacity. Those American Multinationals are not American they now build elsewhere in the world. Who is then worth defending, their assets in the East or their culture in the West? They can now build the tools of war in many other countries in factories owned by those multinationals why do they have to protect the West? Anyone who warns like this is labelled a ‘Conspiracy Theorist’ but Bob is correct, as soon as government is not open and it disguises its real intentions for money and power as with issues such as Firearm Legislation it is a well described ‘Conspiracy’ the only reason we cannot see it, is we take it for granted, we expect to be cheated and lied to by politicians with same fatality as Death and Taxes. 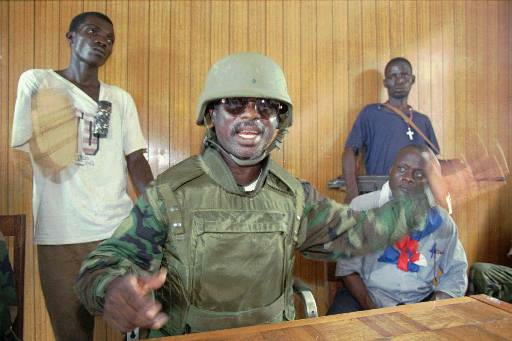 This is a new President Roosevelt from the Congo. Will they be the new world leaders? In past years, like the British Commonwealth before them, the American had a national identity, a sense of purpose and a will. When Teddy Roosevelt was President at the early part of last Century he sent in the Marines and invaded a North African country to rescue an American citizen, (a lady) who had been kidnapped. The message was clear, “Don’t mess with us. Boy.” it probably saved countless thousands of lives in future years. That made the bad guys think before getting nasty with Tourists.